MT1240 excavator thumb line drawing: USA Attachments 1.800.870.3610. MT1240 excavator thumb picking up a pallet. The bucket in this photo was also made from USA Attachments. Yellow MT1240 excavator backhoe thumb waiting to be installed on a machine. DEERE 27C excavator with a MT1240 excavator thumb, picking up an old tub. 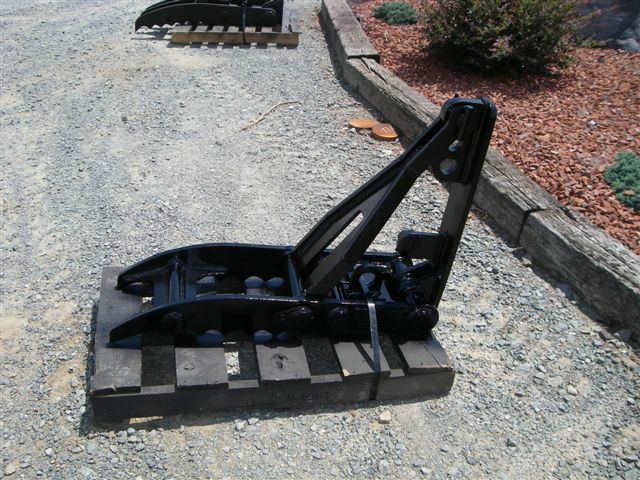 MT1240 excavator backhoe bucket thumb, ready to ship. Frontal profile of the MT1240 excavator backhoe thumb. MT1240 excavator thumb ready to ship. Side profile of the MT1240 excavator backhoe thumb. MT1240 excavator thumb installed on a machine. Side profile of the MT1240 excavator thumb welded on a machine. Another shot of the MT1240 excavator thumb installed on equipment. An MT1240 excavator thumb welded on a machine. This is a photo of the thumb after some use. You are purchasing a NEW thumb.